Clifton Webb, Robert Wagner, David L. Smith, "Sitting Pretty: The Life and Times of Clifton Webb"
Long before his film career began, Webb was a child actor and later a suavely effete song-and-dance man in numerous Broadway musicals and revues. The turning point in his career came in 1941 when his good friend Noël Coward cast him in Blithe Spirit. Director Otto Preminger saw Webb's performance and cast him in Laura in 1944. 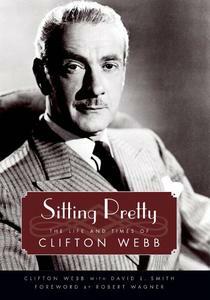 Webb began to write his autobiography, but he said that he eventually had gotten "bogged down" in the process. However, he did complete six chapters and left a hefty collection of notes that he intended to use in the proposed book. His writing is as witty and sophisticated as his onscreen persona. Those six chapters, information and voluminous notes, and personal research by the coauthor provide an intimate view of an amazingly talented man's life and times.